from Big Small Plates, pp. 295-99. It’s time to refocus on eating at home, eating less meat, and eating more vegetables. Recently, I had dinner for the first time at the home of foodie friends, who introduced me to Cindy Pawlcyn’s cookbook. Before that night, I knew Pawlcyn only as the chef/founder of Mustard’s Grill and Cindy’s Backstreet Kitchen, both in the Napa Valley. That night, after tasting my friend’s version of her Avocado-Tomatillo salsa, I decided to invest in the book. Now that I’ve made probably the most complicated recipe in the book, I am determined to mine this book with the dogged determination of a miner panning for gold. It’s a relatively straightforward if long recipe, but, if you try it, you’ll be glad I went first. Because it makes more food than I and my two guests, Mr. and Mrs. Guinea Pig, could eat, I’m going to break the recipe down in such a way that you’ll be able to plan several meals out of it. You’ll have plenty of mole, some salsa, and some beans left over. The dish consists of 5 recipes, some of which can be made the day before. I did not follow the order of instructions as Pawlcyn laid it. Shadowcook: If you live in California and can’t find dried ancho chiles, just accept the possibility that everyone will try to convince you that dried pasilla chiles are the same as dried ancho chiles. I can’t find a straight answer in any of my books, not even in Rick Bayless’s limpid works, as to whether they are or not. So, if you can’t find ancho, use pasilla. You will undoubtedly find one or the other. Shadowcook: Do not go looking, as I did, for chi-chi, boutique Mexican chocolate. Diane Kennedy, the doyenne of Mexican cookbooks in English, calls it Mexican drinking chocolate. My friend Sherry tells me it’s a concoction of chocolate, sugar, almonds, and spices. I found two types, one of them made by Nestle’s. I couldn’t bring myself to buy it, so I opted for the chocolata para mesa made by other brand, El Campisino. It was as far from artisanal chocolate as Nestle’s, but it is what you want. Preheat the oven to 375 F. Stem the [dried] chiles, slit them, and carefully remove and save the seeds. Toast the chiles in the preheated oven 30 seconds to 1 minute, until a little soft and aromatic. Do not toast the chiles too much, or the sauce will be bitter. Put the chiles in a pan with enough warm water to cover and set them aside. Shadowcook: Do you have at hand your rubber gloves that you reserve for working for chiles? You’ll need them. Heat a small skillet over high heat and toast the chile seeds lightly, 30 seconds to 1 minute, shaking the pan continously and watching carefully so they do not burn. Put them in a small bowl. Shadowcook: Normally, I’d recommend that you let the toasted seeds cool. Grinding warm seeds turns them into paste. In this case, it’s pretty much what you want to happen. Using the same pan and shaking it all the while, toast the sesame seeds until they turn a nice golden brown. Set 2 tablespoons of the sesame seeds aside for a garnish. Put the rest in a spice [or clean coffee] grinder along with the chile seeds and grind them to a fine powder. In a separate batch, grind the peppercorns and cloves. Add the ground spices to the ground seeds and reserve. In a large skillet, heat about 2 tablespoons of the olive oil over medium high heat and fry the bread until it’s nice and toasty on both sides. if the oil is hot enough, the bread will not soak up much of the oil. Scoop the bread out into a large bowl. Return the pan to the heat and add another tablespoon of oil to cover nicely the entire surface of the pan. Now fry the tomato, cut sides down first, till caramelized all around and heated through, 6 to 8 minutes. Shadowcook: Try not to move the tomato while it’s frying. The edges and flat surface of the tomato will be crispy so long as you let it fry undisturbed This principal applies to the following step, too. Scoop the tomato into the same bowl. Return the pan to the heat and coat it again with some of the remaining oil. Toss in the onion and garlic and cook until they are caramelized and tender throughout, 8 to 10 minutes. This goes into the bowl, too. Drain the chiles, reserving the soaking water. Working in 2 or 3 batches, puree the chiles, bread, tomato, onion, garlic, ground seeds and spices, and salt in a blender. Blend until smooth, adding as much of the soaking water as needed to get a thick, saucelike consistency. Shadowcook: If you try it in a food processor, it will not be as smooth as the consistency a blender produces. Heat the remaining oil in a heavy saucepan over high heat. When the oil is very hot (but not smoking), carefully pour the sauce into the pan and “fry” it 1 to 2 minutes, stirring. Shadowcook: She’s not kidding when she says “carefully.” It will spatter. The sauce should bubble up on contact with the pan. This is the step that brings the sauce together. Reduce the heat, add the stock [or water], and simmer 10 minutes. Stir in the chocolate. Simmer another 30 to 45 minutes, till dark, rich, and reduced. Set the mole aside, and refrigerate if not using within the hour. Shadowcook: When you’ve finished the mole, you will begin to suspect that you’ve made far too much for a measely coating of the plate under 6 stuffed pasilla. And you’d be right. So, make up your mind to freeze half of what you’ve made and use it with chicken or pork in another meal. Assuming you’re not trying to make the entire dish in one day, before you go to bed, cover half a pound of black beans with enough water to reach two inches above them, and let them soak overnight. Rinse the beans well, picking through to remove any small stones. Put the beans in a large pot with enough water to cover by 2 or 3 inches and soak overnight. The next day, pour off the soaking water and add fresh water or stock to cover. Toast the chile and add it to the beans, along wiht the bay leaf, and bring to a boil. Reduce the heat to a simmer and cook about 1 hour, until the beans are tender, but not so long that they are breaking apart. Skim off any foam that rises to the surface as the beans are cooking. Iff the beans dry out before they are cooked, add a little water and reduce the temperature further. When the beans are done, drain them, reserving the liquid for finishing the dish; return the beans to the pot and set aside. Heat the oil in a small sauté pan over medium-high heat. Add the onion and garlic and cook until translucent. Add the cumin, cook a minute longer, then scrape this mixture into the pot with the beans. Add just enough of the reserved liquid to make the beans saucy but not watery. Stir everything around well and cook over low heat for 15 to 20 minutes more, to infuse the flavors. Add more of the liquid if the beans become too dry. To finish the beans: blend about one-third of them with just enough of the remaining liquid to make a thick paste. Stir this paste back into the whole beans and add a little more liquid, just enough to get a nice consistency. Season with salt and pepper. Just before serving, stir in the cilantro. Note: If you want to use canned beans, two 14 1/2 oz cans should do it. Rinse the beans well and put them in a saucepan. Add the toasted chile, bay leaf, sauteed onions and garlic, and ground cumin. Add enough stock to moisten, and simmer 15 or 20 minutes. Finish as described in the preceding paragraph, but be careful with the seasoning, as some brands of canned beans are already pretty salty. Shadowcook: I promise you, you’ll have more beans than you’ll use to stuff the chiles. Either save the remainder for another meal, or serve the beans as a side dish here. Combine all the ingredients in a mixing bowl and mix gently but well. Taste for seasoning and adjust as you like. Refrigerate until needed. Shadowcook: I bought freshly-made Mexican sour cream, “crema,” which is a touch saltier than commercial sour cream. Combine the crème fraîche, sour cream, cumin, salt, and lime juice and zest in a small bowl. Mix well and keep chilled until needed. Preheat the oven to 350 F. Combine the rice, water, cinnamon, and salt in a small saucepan. Cover and bring to a boil over high heat, then turn the heat to low and steam, covered, for 20 minutes or until the water has evaporated. Meanwhile, place the chiles on a baking sheet and roast about 5 minutes, till the skins are blistered. Shadowcook: I don’t think so. At least, not in my oven. It would take ages for the chiles to blister. I turned my broiler on high and broiled the chiles until the skins were blistered. Took the same amount of time. Put them in a sealed plastic [or paper] bag and let them rest. When they are cool enough to handle comfortably, peel them and cutout the stems as if you were carving a pumkin. Remove the seeds and ribs from the insides of the chiles and the stems. Shadowcook: Be aware that the chiles should be so soft that you risk splitting them when you try to scrap out the seeds. Set the chiles and stems aside. Combine the black beans, rice, and Cheddar cheese in a medium-size bowl and mix well. Carefully fill each chile with some of this mixture, leaving enough space at the top to get the stems back in securely. Shadowcook: I’d go so far as to advise you to stuff less rather than more. 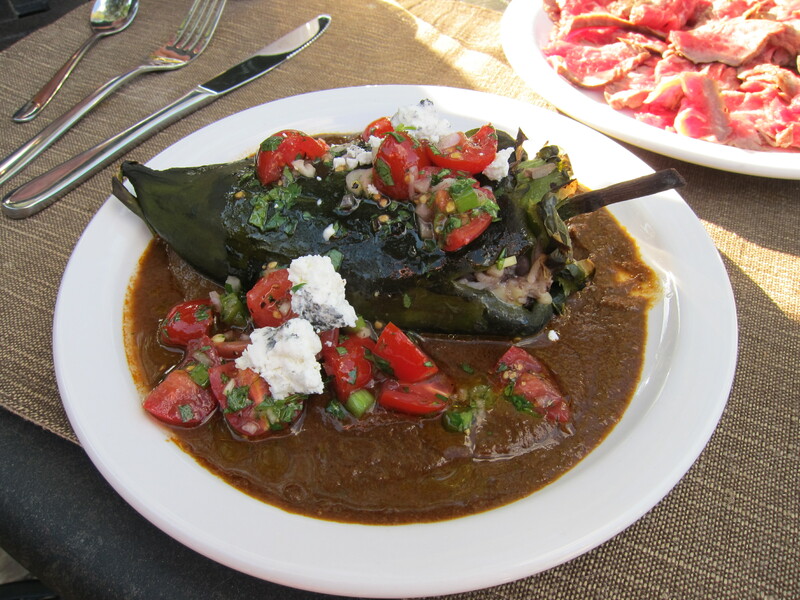 The stuffed chile comes very close to being stodgy if it’s too filled. Don’t pack it in or mashed in the rice mixture. The pasillas can be held overnight in the refrigerator at this point. Shadowcook: But I think that would make it much stodgier. If you need to prepare that far in advance, prepare the mole and the pasillas the day before. Leave the rest for the day you serves them. For the final preparation: start reheating the mole. Shadowcook: I’d reheat in a saucepan no more than 2 cups of the mole. You only need as much as it takes to pour a pool of it on each of six plates. Grill the chiles over medium heat, turning often to ensure they don’t get burned. If you prefer, the pasillas can also be pan-sautéed or baked in the oven at 450 F, 20 minutes if the chiles have been refrigerated, 10 minutes if at room temperature. Whichever method you choose, cook until the chiles are hot through. Shadowcook: The stuffed pasillas are pretty delicate, so I chose to bake them. Even though they had been at room temperature for a few hours, I baked them about 15 minutes. The Cheddar cheese, which brightens the flavor of the dish, needs to melt. Pour some hot mole into the center of each of the plates, and top with a stuffed chile and then some salsa. Finish off with a drizzle of the crème fraîche, followed by a sprinkle of goat cheese, the remaining toasted sesame seeds and the chopped cilantro.